Jails are overloaded with people with mental illness. A key Republican lawmaker wants to examine issue. There have been 52 suicides in Wisconsin county jails from 2003 to 2012. Explore the Center’s map. In 2011, Dr. Ronald Shansky, court-appointed monitor for the Milwaukee County jails, found systemic problems in several areas, including record keeping, delayed access to medical services and medications. Read his letter and other documents about health care in the Milwaukee County jail system. State and national research and reports on jail suicides and inmates’ mental health. For more than a decade, Milwaukee County’s jail system has been under the scrutiny of a court-appointed medical monitor for its failure to provide adequate health care, including for inmates with mental illness. In August, the monitor found mental health care in Milwaukee County’s two jails was still in shambles. Among the problems: Vacancies in top medical positions left jailers to make medical decisions, such as when an inmate should be removed from suicide watch. A man who had threatened to kill himself stopped eating and drinking for four days and was never taken to a hospital. He died in his cell. Mental health advocates and correctional officials agree that Wisconsin’s 72 county-run jails are strapped for resources and not prepared to deal with the large numbers of inmates with mental illness they house. The state Department of Corrections (DOC) is charged with oversight of jails, but the agency’s inspectors are not physicians and, the agency said, not responsible for assessing the quality of health care. The DOC inspection checklist includes whether the facilities keep adequate records, have the correct staff and keep medications secure. In Milwaukee County, for example, the two jails’ most recent DOC inspections last December give no hint of the problems identified by Dr. Ronald Shansky, the court-appointed physician. In a more comprehensive August review, Shansky noted numerous other breakdowns, including in the case of the suicidal inmate who died and a similar case of an inmate with mental illness whose kidneys failed after he refused to drink water or eat a punishment food, Nutraloaf. Just five counties’ jails — Waukesha, Washington, Walworth, Fond du Lac and Dane — are accredited by the National Commission on Correctional Health Care, which uses health-care professionals to assess the quality of care at facilities. Rep. Garey Bies, R-Sister Bay, who chairs the Assembly Committee on Criminal Justice and Corrections, said he plans to ask the DOC to present information to his committee on how well jails are caring for their inmates. As a former chief deputy sheriff, Bies used to oversee the Door County Jail. He said he is particularly interested in ensuring inmates are screened for mental health problems, which he said is crucial to providing proper care, helping them transition back into the community and avoiding crises that could arise while they’re incarcerated. “Do that (screening) up front, and it really cuts down on issues in the long run,” Bies said. In a 2009 DOC survey, less than half of the county jails that responded had a registered nurse or mental health professional doing the initial health screening of inmates; correctional officers did it in most jails. The DOC makes preannounced inspections of county jails annually, and investigates after suicides and other incidents. Technically it has the ability to close jails, though it hasn’t done so since the 1970s, according to a federal Department of Justice report. 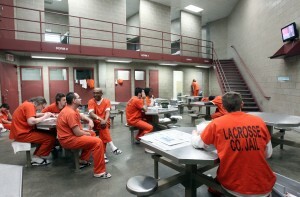 The agency sees its role as one of educating and advising jail managers. “We mitigate risk by providing technical assistance and training, based on best correctional practice,” said Kristi Dietz, director of the DOC’s Office of Detention Facilities. The agency provides verbal or written feedback after inspections, but it doesn’t punish jails with sanctions. A DOC jail inspector added that her job does not include assessing the quality of health care. Lawsuits are frequently cited as an incentive for jails to improve. But “you can’t count on lawsuits to expose these types of problems,” according to Larry Dupuis, legal director of the American Civil Liberties Union of Wisconsin, which sued Milwaukee County over its lack of jail health care services. Ron Honberg, policy and legal director for the nonprofit National Alliance on Mental Illness (NAMI), said county jails nationwide have a “long, long way to go” in providing adequate mental health care. A national study estimated the one in three female inmates and nearly one in six males suffers from mental illness — far higher than the general population estimate of 6 percent. Even after a substantial drop from 1990 to 2010, the national jail suicide rate is still three times greater than in the general population. Jail officials and advocates statewide have been seeing more inmates with mental illness in recent years, although no specific estimates are available. The problems in jails are often overshadowed by those in prisons. But mental health needs may actually be greater at these facilities, where inmates face uncertain fates, more stress and fewer services. And jails aren’t only for short-term detention — some inmates end up spending years there if they have consecutive sentences or their trials are delayed. Walworth County Jail Superintendent Howard Sawyers said his county almost always has inmates who have passed the one-year mark, some staying two or three years. A 2005 U.S. Bureau of Justice Statistics study of mental health at jails and prisons found jail inmates were more likely than prisoners to have mania, major depression or psychotic disorders. Another revealed that jail inmates were more than three times more likely than prisoners to kill themselves. 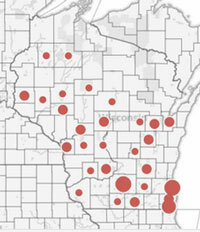 Since 2003, 52 Wisconsin county jail inmates have taken their own lives. According to a Wisconsin Center for Investigative Journalism calculation, Wisconsin’s jail suicide rate in recent years was 40 per 100,000 inmates, slightly higher than the 2007 national rate of 36. According to Dean Meyer, executive director of the Badger State Sheriff’s Association, state-run prisons are “much better equipped” to provide health care. “A prison has their own dentist, their own doctors and their own nurses. And for the majority of county jails, they contract that service out, and the providers only come when needed,” Meyer said. Madison resident Eric Tomlinson can vouch for that. In and out of jail for child support, diagnosed with post-traumatic stress and attention deficit disorders and major depression, Tomlinson struggled with thoughts of killing himself. While in the Dane County Jail earlier this year, he said, he never saw a counselor. Tomlinson said he spent time isolated in “the hole,” a room he described as “a slab of concrete, a mattress, one blanket.” There was nothing to read “other than the (jail) handbook, the Bible or another religious book,” he said. Dane County Jail officials declined to comment on Tomlinson’s account, saying privacy rules prevented them from discussing individual cases. Mental health care varies greatly from county to county, and it can be thin at many county jails. For example, while inmates in Sheboygan County’s 286-person jail shared 40 hours a week of mental health services, those in comparably sized Marathon County received mental health services for “crisis situations.” According to a December 2011 inspection report, the jail planned to begin offering mental health services 20 hours a week. Mental health care can come in a variety of forms. Social workers do much of the work, according to a 2009 survey of county jails. Forty percent of jails reported having a psychiatrist and 26 percent a psychologist, with their weekly hours ranging from one to six. In more than half of jails, nurses were also helping with mental health care. Jailers aren’t medical professionals — but with limited staffing, sometimes they end up acting the part. Sawyers said his officers end up counseling inmates when mental health professionals aren’t on deck. Meyer said jailers sometimes miss mental health problems because they are stretched thin with other jobs. “Quite often in smaller and medium-size jails, because they’re limited staff-wise and they have many other duties and responsibilities, those needs might not get recognized soon enough,” Meyer said. Jails are required by a state law dating back to 1987 to provide the DOC with annual reports on mental health care services. Since 1989, the law has required the DOC to summarize and relay those findings to the Legislature. But the DOC acknowledges it has not been regularly asking jails for the reports, and has not prepared summaries for the Legislature, the Center found. Even experts have trouble characterizing mental health problems in Wisconsin’s jails. Kim Gilhuly, project director for the national advocacy group Human Impact Partners, said she had to rely on national numbers because of the lack of local data when researching a report this fall urging more use of alternatives to incarceration. The Legislative Audit Bureau has recently evaluated mental health care in prisons but not jails. In the DOC’s 2009 mental health survey of jails, only two-thirds responded, and individual answers were not provided in the summary. Bies and a fellow lawmaker, Sen. Kathleen Vinehout, D-Alma, said they are concerned about mental health care in jails, but lack the information to tackle the issue. Vinehout, a member of the Senate Committee on Education and Corrections, said she couldn’t get information she wanted from the DOC about the types of inmates and the care they need. She believes the agency should strengthen its oversight of local jails to help inmates — and the general public. “We want to be able to understand what’s happening and do what we can to lower the cost and make Wisconsin a safer place,” Vinehout said. Inspection reports and the letter from Dr. Ronald Shansky describing systemic problems in record keeping and access to medical services. 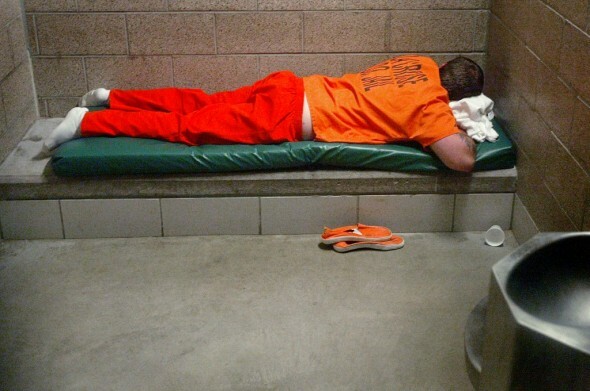 State and national reports on jail suicides and inmates’ mental health. Jails are places for bad people. Bad people don’t only injure other people, they injure themselves too. These same people live on the streets . . . . LITERALLY . . . . and many times they DIE there too. To the mentally ill, it really doesn’t make much difference if they’re in jail or out. It’s the nature of the illness. Mental institutions have patients that commit suicide too. It’s the nature of the illness. Our supreme court doesn’t want the mentally ill kept behind locked doors and in institutions, except in extreme cases. The result is that there are a lot of mentally ill living amongst us, not being monitored. Our society does NOT have the answers for the mentally ill. Sometimes drugs help, lots of times they make matters worse . . . . like in school massacres. I was glad to see that this article did not talk about “the mentally ill,” but rather about people with mental illness. People who have been diagnosed with mental illness vary as much as people diagnosed with diabetes or heart disease. Each person is an individual with different characteristics, resources, and influences. Most people with chronic mental illness, ie people who have been diagnosed with schizophrenia or bipolar illness should not be in the criminal justice system, let alone jail or prison. Most end up there because they cannot, or choose not to comply with mental health treatment. There are community support programs which provide psychiatric, nursing and casework services to people with chronic mental illness which are very successful in working with people with chronic mental illness. Clients enrolled in these programs are able to maintain psychiatric stability. They also receive assistance with housing, money management, medical problems, and just everyday personal problems that come up in everyone’s life. There are far too few community support programs with the result that there are people who could benefit from this type of programming, but they do not have access to them. How do people with chronic mental illness end up in the criminal justice system? Some forget to take their medication, or they run out of medication and cannot get their prescription refilled, or they get robbed, or they get evicted. Each scenario can result in their becoming psychiatrically unstable and then coming to the attention of the police. If they were involved with a community support program, there would be staff to help with all of these problems which in turn would enable them to remain psychiatrically stable. However, there are other people who are psychiatrically stable, but then choose to stop complying with treatment, stop taking medications which have proven to be helpful in the past with the result that they become unstable and then get arrested. And then there is a small minority of people who are psychiatrically stable who commit crimes for other reasons not due to psychiatric instability. I worked in a community support program for 28 years. We had some clients who had been in and out of the criminal justice system. They were legally required to comply with treatment at our program. As a result, they maintained psychiatric stability. Many then chose to remain voluntarily with the program upon the completion of their sentence. Some of these people were there for over 20 years without ever having any further contact with the criminal justice system. Some chose to leave the program upon completion of their sentence. Many of them became psychiatrically unstable and were arrested and eventually referred back to our program. Same story. Some would stay and remain stable, some would leave, become unstable and eventually come back again. The revolving door. A person with untreated mental illness who ends up in jail is often psychotic. From both a moral and pragmatic point of view, it is just common sense to quickly provide that person with professional treatment. A person with psychosis is suffering needlessly and at the same time probably causing a lot of stress for both staff and other inmates. For the safety and well being of everyone concerned, prompt, effective treatment is much more humane and cost effective than solitary confinement. You could also have mental health courts where the judges, prosecutors and defense attorneys are familiar with effective mental health treatment. An individual with a diagnosis of a chronic mental illness could be released on the condition that he or she cooperate with treatment thru a community support program. If the person did not cooperate, staff from the program would report this to the judge and the person could face being taken back into custody. There also could be more creative and energetic use of the civil commitment system. Most people would agree that it is more humane to confine a psychiatrically unstable person in a psychiatric hospital rather than in a jail. This would require a reevaluation of the civil commitment system along with directing more resources to its effective implementation. You can make the case that if we had a thoughtful, responsible and effective civil commitment system, there would be far fewer people with chronic mental illness in our jails and prisons. You can also make the case that it is penny wise, but pound foolish to not direct money and resources toward building a comprehensive policy on how to provide effective treatment for people with chronic mental illnesses.